Hey guys, Agent Martineau here. 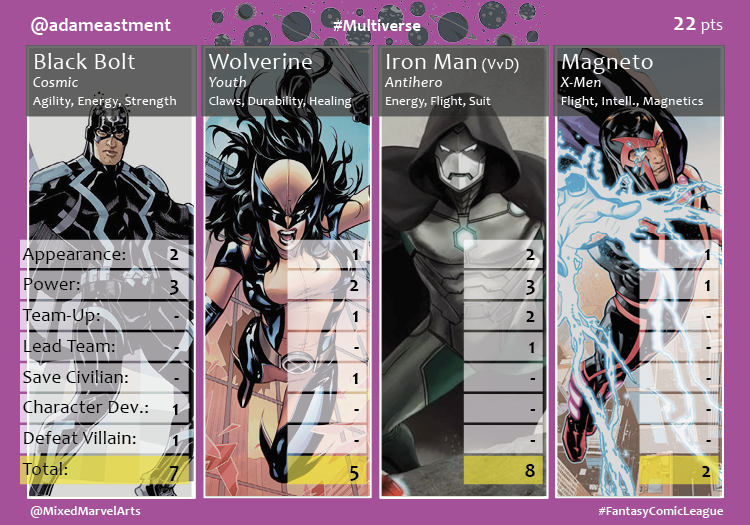 The Fantasy Comic League has officially expanded to three divisions and rather than pick something silly (like Midtown) or inappropriate (like Wakanda), I decided to launch the Multiverse Division. Dragging Agent Swampy out of a struggling Midtown division, we brought several new recruits on board: Agent Diaz, Agent Adam, and Agent Hyrup. 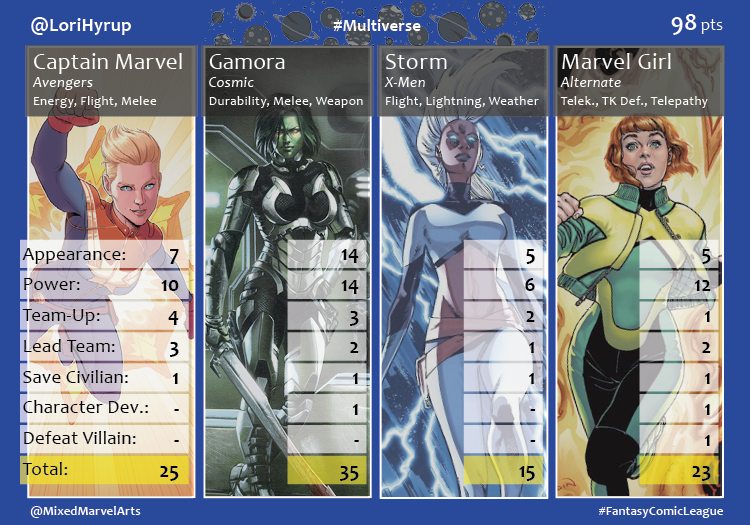 In an unexpected turn of events, newcomer Hyrup defeated league veterans Agents Martineau and Swampy, with her all female team of Captain Marvel, Gamora, Storm, and Marvel Girl (not all that shocking though, I mean who runs the world?) Her team fell just shy of 100 points. 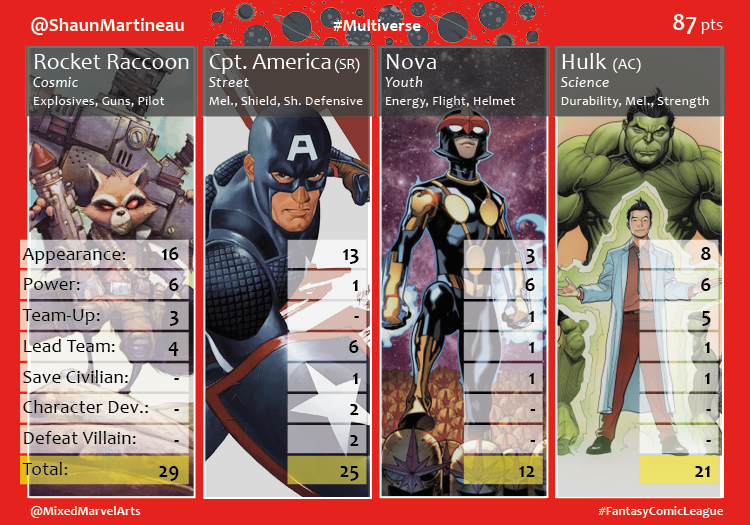 Agent Martineau took second place with a team banking heavily on the Guardians movie (with Rocket) and the Secret Empire event (with Steve Rogers & Nova). He brought in 87 points, which was enough to stop Agent Swampy’s team of League heavy hitters (Peter Parker, Wade Wilson, and Logan.) Agent Swampy took 3rd place with 78 points. 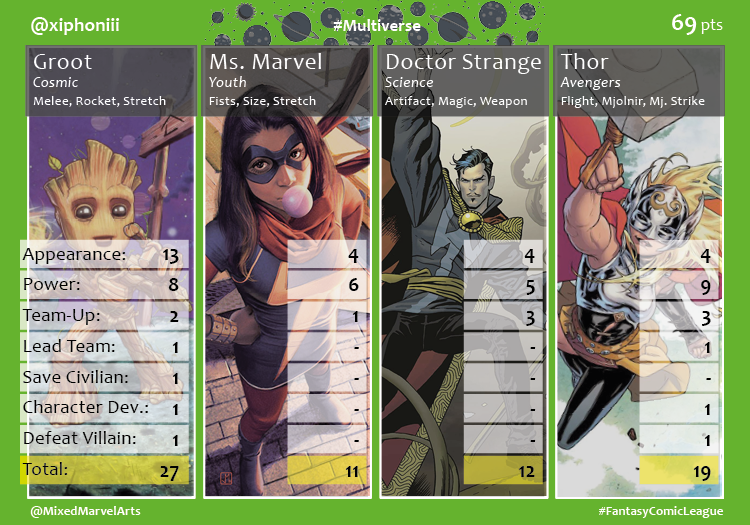 Agent Diaz was not too terribly far behind with 69 points with a team of popular characters like Doctor Strange, Thor, and Groot. 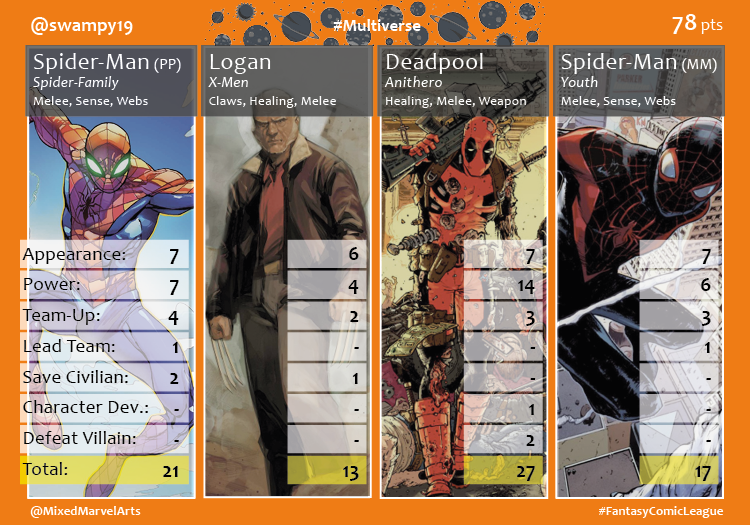 Sadly, Agent Adam’s faithfulness to characters near and dear to his heart (Victor Von Doom, Black Bolt, and Laura Kinney) hurt him pretty hard; Agent Adam brought in 22 points total for the month. Congrats again to Agent Hyrup, long may she keep the seat warm for my inevitable victory.